Coral reefs often characterise the immediate subtidal environment in tropical regions. The definition of a coral reef is a loose one. In one sense, it is simply a hard substratum that supports corals. Many geologists, however, restrict the term to large subtidal hard bottoms ('reefs') in which the hard base (that may be 1-2 km thick on some reefs) consists mostly of dead corals, generated by the death and assimilation of the carbonates fixed by coral polyps into the hard substratum, usually beneath a living veneer of live corals. This process is unique to reef-building or hermatypic corals, which contain symbiotic algae or zooxanthellae, and typically occur in tropical regions in which the average winter water temperature is greater than 18°C. However, corals themselves, and the organisms associated with them, are not constrained to reefs generated in this way. On the Great Barrier Reef (GBR) corals occur both on carbonate reefs, as geologists define coral reefs, and on geologically-formed rock bases such as granite. These rock bases occur on the mainland and on islands in the centre of the GBR itself. In these areas corals simply form a structural veneer, contributing physical and biological structure to the underlying hard rock. On volcanic-origin islands, particularly in the south (to about 30°S), scleractinian corals may also be found mixed with tufting and laminarian algae (groups more characteristic of temperate reefs). The organisms that occupy carbonate and non-carbonate reefs are the same, and interact with the reef and other organisms in the same way, consequently we include both carbonate and non-carbonate reefs under the broad umbrella of 'coral reefs'. This imprecise definition is unfortunate, but necessary. Geologists have a clear definition of a 'coral reef' as a geomorphological structure built by corals. It can also be argued that the structural veneer—the coral communities themselves— are the central component of coral reefs. However, not all organisms on a coral reef are positively associated with corals. A reef community is more than its physiographic origin and dominant space-occupiers. A key to the diversity of a coral reef lies in its habitat heterogeneity, which of course includes areas that are not occupied by corals themselves. Assemblage. A set of the organisms that occur at any defined level of habitat. Occasionally used interchangeably with 'community', the complete set of ecologically interacting species. Facultative habitat associate. A species usually found in a particular habitat patch type, but which can survive in other habitats, such as the damselfish Pomacentrus moluccensis. Habitat. In a strict sense, the place where an organism lives. Usually considered at one of several spatial scales. Habitat determiner. An organism that interacts with, and alters the impact of, a habitat former. Crown-of-thorns starfish are habitat determiners. Their predation on corals may exert strong effects on those species reliant on the habitat structure or heterogeneity provided by the corals. Habitat former. An organism that generates a physical structure that forms a habitat for another organism. Tabulate corals such as Acropora hyacinthus are habitat-formers. Habitat generalist. A species that occurs across a wide range of habitat patch types. Habitat homogeneity. The degree to which constituent areas forming a habitat mosaic, habitat zone, or landscape are similar in type or distribution. Habitat interface. The junction between different adjacent habitat patches. Habitat mosaic. A spatially cohesive collection of habitat patches. Habitat patch. A discrete, internally homogenous uniform area with a characteristic physical structure or biotic composition. Habitat responder. An organism that simply occupies habitat, without forming habitat for others or altering the action of a habitat former. Habitat zone. A habitat mosaic with a recognisable physiographic and environmental setting. Landscape/seascape. A spatially cohesive collection of mosaics or habitat zones. Landscapes (or seascapes) are not easily defined and are perceived at a wide range of spatial and temporal scales by marine organisms. While many coral reef organisms are sedentary and restricted in their ability to move between habitat patches, during their larval phase they may sample the environment at much larger spatial scales. Microhabitat. A characteristic position within a habitat patch. Obligative habitat associate. A species that is only found in a particular habitat patch type, such as gobies of the genus Gobiodon. being what an organism perceives within its range of movement and response. We will start by considering organisms in the context of their interactions with their habitat then introduce the concepts of temporal and spatial variability in generating habitat heterogeneity. Then we shall consider how defining habitat independently of a particular organism or set of organisms is rather challenging, and conclude with some general comments on the importance of habitat heterogeneity in maintaining biodiversity on the GBR. An important distinction between temperate rocky reefs and coral reefs is that living organisms (e.g. her-matypic corals, and octocorals) generate the primary hard superficial benthic structure in coral reefs. While temperate macroalgae such as giant kelps, like Macro-cystis pyrifera, also generate habitat structure by extending physical complexity into the water column, corals contribute to complexity whether dead or alive. Corals can be considered as habitat formers. This biological structuring has several important consequences for the ecology of coral reefs. Coral growth forms vary greatly from one species to another, and even within the same species under different environmental conditions. Growth forms range from featureless encrusting forms, to massive corals with large physical mass but little small scale structure, through to branching forms with complex structure and interstices that can provide shelter to a large number of species, and large numbers of individuals within a species (Fig. 5.1). Consequently, the coral species composition and environmental conditions at a site can, to a large extent, determine the habitat structure. Corals also exist in a range of assemblage types. Monospecific stands of corals will generate habitats with a very similar structure across their extent, whereas mixed-species stands will generate more variable habitats. In addition, not all hard bottom in a coral reef is covered by corals, so further habitat heterogeneity is generated by rock, rubble, and sand substrata, and other habitat formers such as soft corals. attracted to habitats of a certain type, but then alter that habitat type and may move on. Habitat determiners, however, need not necessarily be destructive. For example, urchins, such as Diadema, graze algae, and surgeon-fishes, such as Ctenochaetus striatus, remove detritus from the reef top and by doing so both species help maintain space that is suitable for coral recruitment. Coral reefs are important because of the organisms or habitat responders that live on them. Although fishes are the most obvious occupants of coral reefs, a vast array of organisms from a wide range of phyla including molluscs, worms and so forth make up tropical reef biodiversity. Associations between organisms and the coral reef habitat are complex. Some organisms, such as coral gobies (Gobiodon, Paragobiodon) are very specialised in their habitat association and will only be found in a few species of hard corals (Fig. 5.2A, B). They are also obligate specialists—they never occur on a reef if their preferred coral is not found there. Most coral reef habitat responders are not obligate specialists, however. Many fishes, for example the lemon damsel Pomacentrus moluccensis, are commonly associated with particular habitats such as branching hard corals (Fig. 5.2C, D), but they are not restricted to particular species of coral, and indeed may be found in habitats that are devoid of live coral. Other fish species may be found in reef habitats irrespective of live coral, such as many wrasses (e.g. Cheilinus digramma, Fig. 5.2E, F). Measuring the predictability of the composition of habitat-responding communities, given habitat availability, is fraught with difficulties. Various studies have reported a difference of anywhere between 5-70% coral cover is required to detect changes in abundance of habitat responders such as fishes. A large amount of the variability in estimates may be due to methodological differences. This is an issue that needs to be addressed, but it appears that coral cover alone does not sufficiently explain patterns of variability in many habitat responders. It is important to realise that coral reefs are not simply homogenous areas of corals on which organisms live. Spatial variability occurs at a range of scales (Fig. 5.3). At the finest scale, relatively homogenous areas such as single coral heads, rubble patches, or algal covered rock, form habitat patches at scales from centimetres to metres (Box 5.1). These habitat patches may indeed form the entire habitat of extreme specialists. Coral gobies, for example, are restricted to a limited species range of live coral heads and they will not move from a single coral head. For many organisms though, the habitat patch is not necessarily the smallest habitat unit. In a patch of staghorn coral, for example, some species may live at the base of the coral whereas others may live near the top. In this way, habitat patches can also be subdivided in a range of microhabitats. The microhabitat need not be completely contained within a single habitat patch. Some species use microhabitats at the transition of different patches. Physical, temporal, and biological variability generates heterogeneity in the environment at larger scales of tens to hundreds of metres. On coral reefs this is often termed a habitat zone, that is, a collection or mosaic of different habitat patches, and is usually characterised by a combination of biotic, physical, and physiographic factors. On the GBR the seaward side of reefs (facing the continental shelf break) typically have a shallow reef crest, which may also be present or absent on the leeward side of reefs. 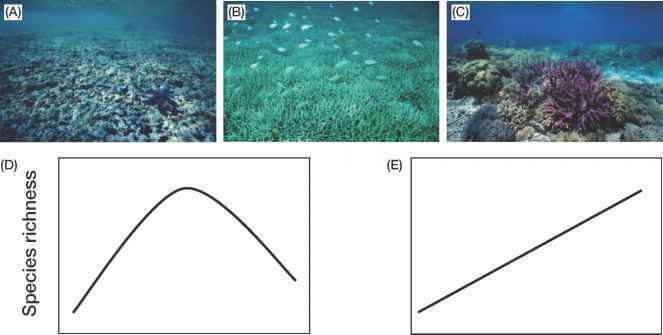 This is a shallow zone in which coral growth rates are high, but the corals are also subjected to wave action and currents (Fig. 5.3). The reef crest will consist of stands of different coral species, interspersed with rock covered with encrusting algae. The reef crest sharply breaks to a reef slope, which is generally steeper, with a stronger depth gradient on seaward sides of reefs that are exposed to the prevailing winds, and hence have much more coral growth with well developed reef crests and slopes (but also subject to more wave disturbance). This reef slope is not just a continuous band of corals, however. On exposed reefs in particular, the reef slope is punctuated by grooves in which coral rubble accumulates as a result of wave disturbance and rips. On the leeward side of the reef crest, a shallow reef-flat zone often containing rubble, sand, and fleshy macroalgae such as Padina or Sargassum species might occur. This zone is in very shallow water, exposed to wave action, with little vertical physical structure and heterogeneity. On reefs with lagoons, the reef-flat zone will give way to a lagoonal habitat zone, relatively sheltered from wave disturbance. The lagoon may often be very coral-rich in clear lagoons, but possibly devoid of corals in turbid lagoons. In the centre of the lagoon fine sediments occur, providing yet another set of microhabitats. Large Porites colonies (metres wide and high) are rare on the exposed sides of reefs, but are often common on the leeward sides of reefs and in lagoons. On the leeward side of a typical reef, the lagoon will give way to a back-reef habitat zone. The back-reef is often rich in corals because visibility is good; not as good as the exposed side, but wave disturbance is much lower. This collection of habitat zones forms a landscape or seascape within which biodiversity exists on a single coral reef and while there is considerable small scale spatial variability in habitats, at the spatial scale of 100's of metres to kilometres the physical structure of the reef is relatively unchanging and predictable at ecological time scales and the spatial distribution of habitat responders across a reef landscape becomes very predictable. Clearly the integration of habitat patches into zones in the reef landscape generates an enormous range of different types of places for different types of organisms to live, even taxonomically related species. And while these organisms can be characterised as 'coral reef' species, they may not actually be associated with corals themselves. However, the reefs themselves form part of a larger seascape of multiple reefs that constitute the GBR (Fig. 5.3). scale current patterns (see Chapter 4), and smaller scale currents, which in turn interact with the profile and relative positions of the individual reefs along the continental shelf. These have important consequences for larval transport, and ultimately biological connectivity between the organisms on different reefs. The GBR crosses a large latitudinal range of approximately 14°52', which means that temperature tolerances of many species may exert large effects on the assemblage composition of southern v. northern reefs, just as the large width of the continental shelf exerts effects due to sedimentation and exposure regimes. This wide range of spatial variability in habitat availability has profound effects on the habitat formers, determiners, and responders that live on the reefs. The 'typical' zonation patterns described previously may not occur on all GBR reefs, so there is also an additional level of heterogeneity at the reef level. Coral reefs, as with most habitats, change through time. Coral reefs are subject to a wide range of natural and anthropogenic perturbations, which can alter their structure and heterogeneity (Fig. 5.4). At large spatial scales, the Pacific Decadal Oscillation can generate oceanwide changes in temperature and primary productivity regimes, which may operate for many decades. At slightly shorter temporal scales, El Niño Southern Oscillations may generate oceanwide fluctuations in temperature, wind strength, and oceanographic upwelling over time periods of 3-7 years. These fluctuations may in turn contribute to large scale disturbances such as coral bleaching during warm water events, and cyclones. Biological disturbances may also operate at large scales, such as parrotfish feeding-scars (Fig. 5.4A, B). Crown-of-thorns starfish (COTS) outbreaks can kill corals on vast areas of reef (Fig. 5.4C, D). Large scale perturbations typically take a long time to recover, and if they occur together (e.g. coral bleaching and COTS outbreaks) their combined effect may further increase recovery time. Physical conditions will also facilitate biological disturbances. Particular combinations of suitable oceanographic conditions may result in increased survival rates of COTS through increased larval nutrition and condition and dispersal to suitable habitat. Conversely, some environmental conditions may favour survival of pathogens, which may affect habitat determiners such as Diadema urchins. The interaction between physical and biological processes is important because of the different scales of each; physical processes, which usually occur at a large scale, may effectively force biological processes to occur at a similar scale. This spatial autocorrelation (i.e. the abundance or ecological interactions of organisms are more similar at locations closer to each other) has been termed the Moran Effect. The consequence of this is that minor biological effects that would appear only to exert local effects can, if generated by physical forcing, occur over a much larger spatial extent than would be predicted. Small scale disturbances may also have important and immediate consequences for habitat structure. 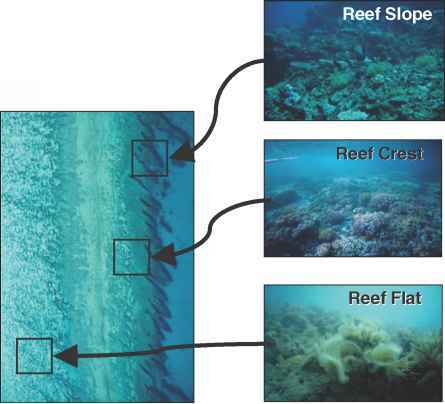 Storm damage can range from localised damage to individual coral heads, up to complete coral removal across 100 m swaths within windward sides of reefs, and across several reefs (Fig. 5.4E, F). These types of disturbances are not necessarily detrimental to a reef's overall health. Removal of a coral colony by storm damage frees up space for recolonisation by other species. It also generates heterogeneity in the substratum, so habitat responders that prefer bare rock or rubble can occupy the space that is cleared by the disturbance. In this way, local disturbances within a coral reef can actually increase species diversity. In low disturbance regimes competitively dominant species, which may be fast growing in disturbed habitats, large, and can overgrow other species, will form large monospecific stands. The diversity of corals in these stands, and habitat responders will be low. In contrast, highly disturbed areas will have a low coral diversity, and the substratum will consist primarily of encrusting algal and coral forms. These organisms provide little structural heterogeneity, and consequently species diversity in highly disturbed habitats will be low. However, at intermediate levels of disturbance, the abundance and cover of competitively dominant species is reduced due to their higher susceptibility to disturbance, which in turn frees up space for other coral species. At intermediate disturbance levels, coral diversity increases. The relationship between coral diversity and disturbance is reflected in the diversity of many habitat responders (Fig. 5.5D, E). Fish diversity, for example, tracks coral diversity with the highest species richness found at intermediate coral densities that in turn are associated with higher levels of habitat heterogeneity. In contrast with the competitive-disturbance mechanism generating coral diversity, the tracking of coral diversity by habitat responders is usually not due to competition, but rather the provision of a range of habitat types, which enables a range of species with different habitat preferences to occupy the same area. Although natural disturbance is a normal part of coral reef ecology, and an important process that generates habitat variability, anthropogenic disturbances also exert effects at a range of spatial and temporal scales. Boat anchors may generate local coral damage. Artisanal fishing practices such as netting, trampling, and rock-throwing (although not a major influence in the GBR) may generate local coral damage in reef systems. Commercial fish extraction practices such as cyanide and explosives, again not common on the GBR but widespread in other parts of the world, may generate more widespread physical damage. Extraction of certain fish species may itself have biologically mediated effects. For example extraction of herbivorous fishes such as parrotfishes (Scaridae) may lead to increased growth of macroalgae, which may in turn lead to lower coral cover and, importantly, reduce the ability of corals to recruit onto bare space. At larger scales, increased sedimentation and eutrophication may result from land-based human practices such as deforestation, agriculture, and sewage outfalls. The resulting changes in water quality are usually long-lived, and may alter the trophic regime, light levels, and increase stress to corals via sedimentation. These stresses may in turn lead to increased susceptibility of corals to environmental fluctuations such as temperature changes (see Chapter 9). undergo a natural succession of community states in which the space is colonised by encrusting coralline algae, which then provides a suitable substratum for coral settlement. Rapidly growing forms, such as branching and plating corals, then occupy this space but may be supplanted over time by more wave resistant forms. Extreme physical disturbances or widespread coral death may result in a reef being covered by coral rubble. Whether the rubble forms a substratum for coral or algal communities may be dictated by the numbers of herbivores on the reef. 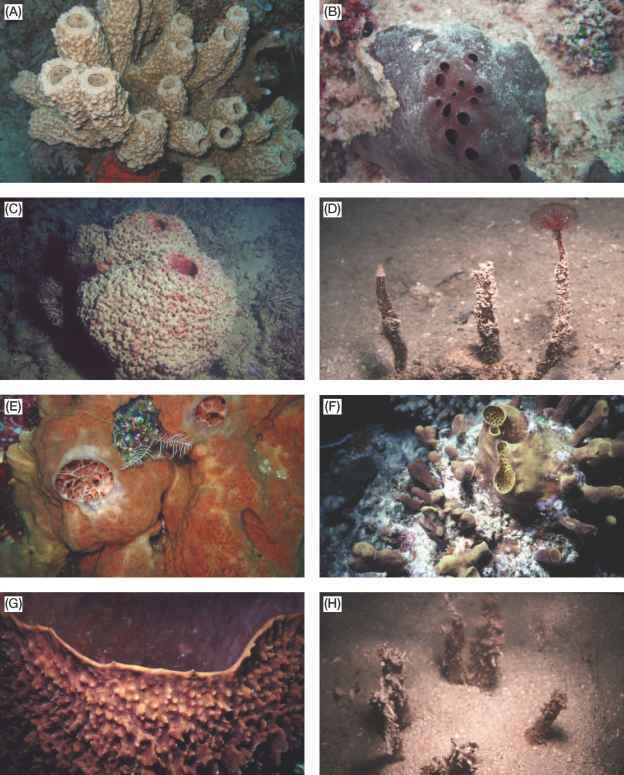 Exclusion of herbivores can result in algal takeovers of areas previously occupied by corals and fleshy and tufting algae such as Padina can occupy space following COTS outbreaks or bleaching. It is important to realise that coral reefs are not static, stable, unchanging ecosystems. The abundances of coral reef organisms change at temporal scales ranging from days to multiple decades, and at spatial scales ranging from a single coral head to entire reefs in which their preferred habitat occurs. Species that are not as habitat-specific will be found on a wider range of reefs. So, a reef with a diverse range of corals will tend to have more species, both specialists and generalists. However, not all species are associated with corals. Some species prefer areas without corals, or the interfaces between different patches. Consequently, species diversity may actually be higher in areas where coral cover lies at an intermediate value. Pelagic species may occur around coral reefs simply because they form the only physical structure in the ocean, which in turn may provide shelter and alter water currents that, in combination may attract prey and provide suitable spawning sites. If alternative structures are available, these species may occupy them irrespective of whether they were generated by, or covered by corals. These different temporal and spatial scales of habitat variability combine synergistically to provide an enormous range of different types of potential habitat for a huge diversity of organisms on the GBR.